As we head towards the farmhouse in Carlos Keen, the sky is ablaze with the splendor of an Argentine sunset. But all at once, as we pass the poor neighborhoods along the highway to Lujan, it seems as if dusk has descended, replacing the golden light of the setting sun. Except it isn’t dusk. It’s smoke from the incinerator burning the region’s garbage falling like a deadly cloak, wrapping itself around the homes of the people who live in the impoverished countryside. 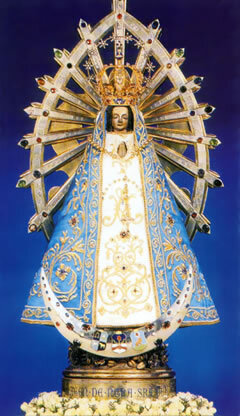 Nothing like the gem-studded cape in which the Virgin of Lujan, protector of the people, is typically depicted. Up close, the poverty of the people she is believed to protect and whose deep devotion she enjoys is only too obvious. Pope Francis’ Christmas prayer included a call for protection of the environment against greed and rapacity. Perhaps the Virgin of Lujan and Mary the Untier of Knots might find in this pope the means to undo so many years of wrongs, in too many of which we have been complicit as a church, and as people of faith. I�m going into hiding now to prepare for my class this afternoon.